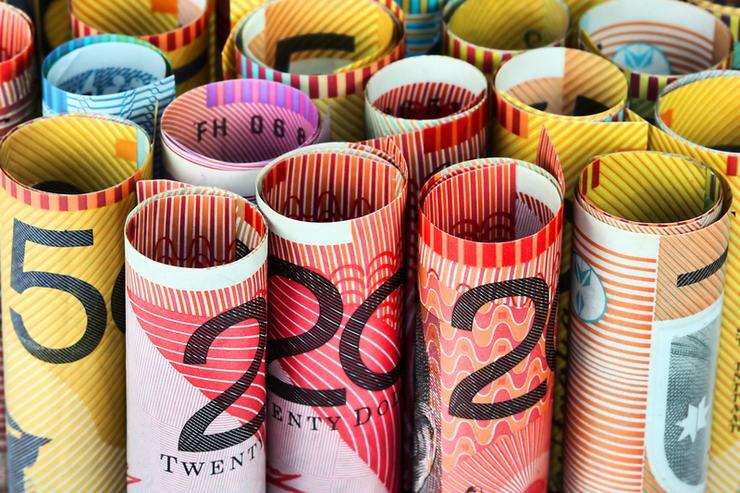 ​Aussie IT spending increases, but where’s the money going? Investment increases across devices, software and IT services but data centre spending stalls. 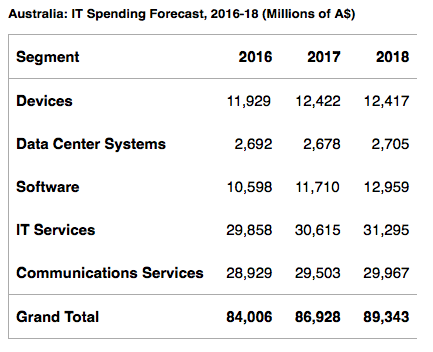 Increased investments in devices, software and IT services will see technology spending in Australia reach almost $87 billion in 2017, representing an increase of 3.5 per cent from 2016. Backed up by a mini-revival in the printers, PCs and tablets market, Australian businesses will also boost investments across software and IT services, with data centre spending stalling due to slow server uptake in the wake of increased cloud adoption. Meanwhile, worldwide IT spending is projected to total US$3.5 trillion in 2017, a 1.4 per cent increase from 2016. According to Gartner, this global growth rate is down from the previous quarter's forecast of 2.7 per cent, due in part to the rising U.S. dollar. 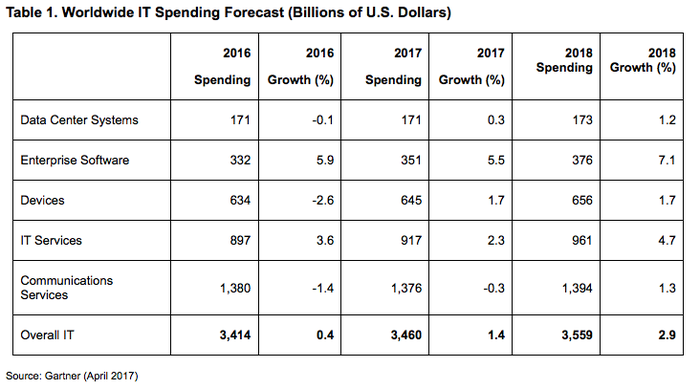 “The strong U.S. dollar has cut $67 billion out of our 2017 IT spending forecast,” Gartner research vice president, John-David Lovelock, said. Specifically, Lovelock said the data centre system segment is expected to grow 0.3 per cent in 2017. While this is up from negative growth in 2016, the segment is experiencing a slowdown in the server market. “We are seeing a shift in who is buying servers and who they are buying them from," Lovelock added. “Enterprises are moving away from buying servers from the traditional vendors and instead renting server power in the cloud from companies such as Amazon, Google and Microsoft. Driven by strength in mobile phone sales and smaller improvements in sales of printers, PCs and tablets, worldwide spending on devices (PCs, tablets, ultra-mobiles and mobile phones) is projected to grow 1.7 per cent in 2017, to reach US$645 billion - this is up from negative 2.6 per cent growth in 2016. Meanwhile, mobile phone growth in 2017 will be driven by increased average selling prices (ASPs) for phones in emerging Asia/Pacific and China, together with iPhone replacements and the 10th anniversary of the iPhone. In addition, Lovelock said the tablet market continues to decline significantly, as replacement cycles remain extended and both sales and ownership of desktop PCs and laptops are negative throughout the forecast. “Through 2017, business Windows 10 upgrades should provide underlying growth, although increased component costs will see PC prices increase,” he added. Furthermore, the 2017 worldwide IT services market is forecast to grow 2.3 per cent in 2017, down from 3.6 per cent growth in 2016. “The modest changes to the IT services forecast this quarter can be characterised as adjustments to particular geographies as a result of potential changes of direction anticipated regarding U.S. policy - both foreign and domestic,” Lovelock added.